NEW YORK, N.Y. - Nazem Kadri won't be playing again for the Maple Leafs this season. The NHL suspended Kadri for Toronto's final four games for his cross-check to the head area of Red Wings centre Luke Glendening. Kadri hit Glendening in the second period of an eventual 3-2 loss on Saturday after the Detroit pivot knocked Kadri's helmet off in the offensive zone. 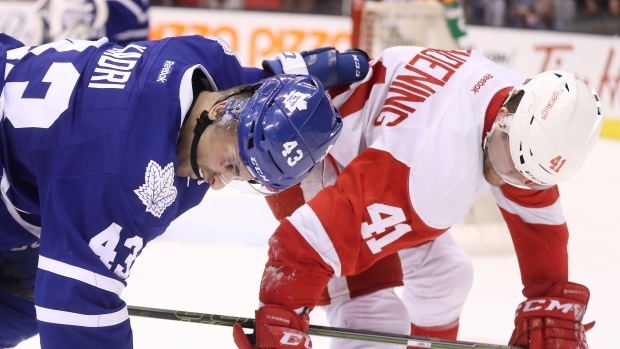 Kadri's cross-check left Glendening briefly down on the ice and drew a two-minute penalty. Leafs head coach Mike Babcock felt Kadri initially targeted Glendening's arm following a battle in the corner, with his check riding up into the shoulder and head area. "You've got to command your fair share of the ice if you're going to play hard," Babcock said ahead of Toronto's game Monday night against Florida. "You can't cross-check people in the head. You're allowed to cross-check them in the meat of the arm though." As a repeat offender under the collective bargaining agreement, Kadri will forfeit US$200,000. Kadri has drawn the attention of the NHL numerous times in recent weeks. He was cited for three instances of diving and fined $5,000 last Friday. The 25-year-old was unrepentant afterward, in total disagreement with the interpretation of diving. "I think you can make a penalty more obvious but that doesn't change the fact that it's still a penalty," said Kadri. "Diving and making something a little more obvious is two different things." The Leafs recalled Rich Clune for the Marlies on Monday morning to replace Kadri, who leads the Leafs with 45 points this season.